1858—The steam screw frigate, USS Niagara, and the British ship, HMS Agamemnon, depart Queenstown, Ireland, to assist in laying the first trans-Atlantic telegraph cable. 1898—Santiago, Cuba surrenders to U.S. Naval forces during the Spanish-American War. 1927—Maj. Ross E. Rowell, USMC, leads a flight of five DHs, which are two-seat biplanes, in a strafing and dive bombing attack against bandit forces surrounding a garrison of marines at Ocotal, Nicaragua. 1944—USS Gabilan (SS 252) sinks Japanese minesweeper (W 25) northwest of Zenizu, Japan. 1975—U.S. Apollo (Apollo 18) and Soviet Soyuz (Soyuz 19) space craft dock in space, making the first manned space flight conducted jointly by the 2 nations. The Apollo craft remains for 9 days, 1 hour, and approximately 28 minutes. USS New Orleans (LPH 11) later recovers the Apollo craft. National news headlines today continue to be dominated by media reports of the summit that occurred yesterday between President Trump and Russian President Putin. As part of an effort to increase unpredictability, the Harry S. Truman Carrier Strike Group will return to Norfolk just three months after deploying reports the Virginian-Pilot. "Let me be clear - all returning units are 100 percent mission-capable and will remain in the sustainment phase of the Optimized Fleet Response Plan, which means they will sustain warfighting readiness and be ready to surge forward or redeploy when called upon," said U.S. Fleet Forces Commander Adm. Christopher Grady, indicating that the strike group remained combat ready despite returning to its homeport. Stars and Stripes reports that North Korea has agreed to hand over as many as 55 sets of remains believed to be from American troops killed in the 1950-53 war, and to allow the United States to fly them out of the country next week. Additionally, Seapower Magazine reports that the Navy's Program Executive Office Unmanned and Small Combatants announced the completion of two littoral combat ship Anti-Submarine Warfare Mission Package milestones. France defeats England at Castillon, France, ending the Hundred Years' War. Peter III of Russia is murdered and his wife, Catherine II, takes the throne. France limits the importation of goods from Britain. National Guard troops open fire on a crowd of demonstrators in Paris. Ottoman forces, supported by the British, capture Aboukir, Egypt from the French. The U.S. fleet arrives in Tripoli. Napoleon Bonaparte surrenders to the British at Rochefort, France. Andrew Jackson becomes the governor of Florida. Confederate President Jefferson Davis replaces General Joseph E. Johnston with General John Bell Hood in hopes of defeating Union General William T. Sherman outside Atlanta. U.S. troops under General William R. Shafter take Santiago de Cuba during the Spanish-American War. Field Marshall Erwin Rommel is wounded when an Allied fighter strafes his staff car in France. Chinese communists attack the Nationalist army on the Yangtze River. American pilot Francis Gary Powers pleads guilty to spying charges in a Moscow court. Ho Chi Minh orders a partial mobilization of North Vietnam to defend against American airstrikes. Lt. Col. Oliver North and Rear Adm. John Poindexter begin testifying to Congress regarding the Iran-Contra scandal. For the Times, the battle will be existential, life and death. Its execs are the proud owners of the single greatest scandal in American media history. The most formidable obstacle is the media, particularly the New York Times. The saying goes that a scandal becomes a scandal only when the Times calls it a "scandal" on the front page. Given this definition, Barack Obama and his media acolytes can pass a lie-detector test when they speak of Obama's "scandal-free" presidency. From the moment Strzok entered the committee hearing room, one could sense his confidence that the Times and other media, as well as the Democrats on the committee, would represent his interests. He was right. From the Times' perspective, if there was a scandal, it was the cruel "grilling of the FBI agent." One Times headline – under the wishful rubric "Trump's Russian Connection" – read simply, "Shouting and Personal Attacks at Strzok Hearing." This is the same Peter Strzok whom Trump accurately called "a disgrace to our country." In the case of Peter Strzok, the Times was primarily defending the Democratic Party and the larger progressive agenda. Only indirectly was the Times protecting its own reputation. In the case of TWA 800, the Times has much more at stake. 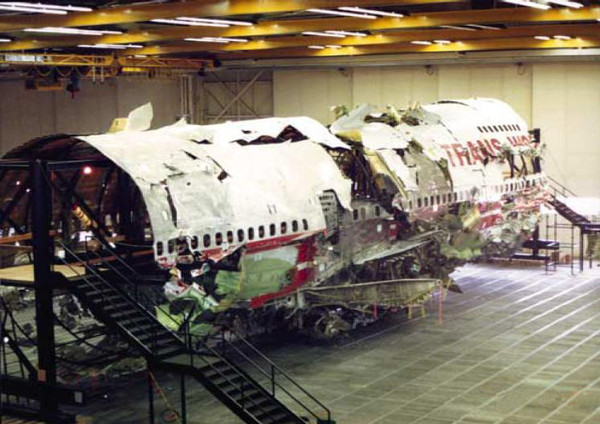 TWA 800 crashed in the Times' backyard. Given the paper's power and proximity, the FBI talked almost exclusively to Times reporters. In the first two months of the investigation, the Times reported the facts as the FBI provided them. In that those facts did nothing to harm the re-election chances of Bill Clinton in November, the Times saw no reason to challenge them. The Times' myopia became obvious one month into the investigation, when reporter Andrew Revkin introduced readers to Witness 136, Michael Russell. Russell told the FBI he was working on a survey vessel a mile offshore when "a white flash in the sky caught his eye." Of the of the 258 FBI witnesses to a likely missile strike, Russell was the only one the Times ever interviewed. The FBI judged Russell's story credible because it fit with the bureau's already skewed plot line. This was not Russell's fault. His observations were honest and accurate. He caught the "white flash" out of the corner of his eye. Russell's account, Revkin reported, "bolstered the idea that a bomb, and not an exploding fuel tank, triggered the disintegration of the airplane." More to the point, his account "substantially weakened support for the idea that a missile downed the plane." That was the article's money quote and the reason readers were allowed to hear from Michael Russell. A week later, the Times ran a front-page, above-the-fold article with the screaming headline "Prime Evidence Found That Device Exploded in Cabin of Flight 800." According to the Times, only the FBI's uncertainty about whether the device was a bomb or a missile kept the bureau from declaring TWA 800's destruction a crime. By mid-September 1996, feeling confident they had the Times eating out of their hands, Clinton officials in Washington shifted from a bomb explanation to mechanical failure, and the Times shifted right along with them, with shockingly few questions asked. The explosive residue throughout the aircraft – the "prime evidence" of a month ago – disappeared without a credible explanation. Michael Russell's assertion that he did not see a fuel tank explosion was simply forgotten. By November 1996, with Clinton successfully re-elected, the Times was blaming the "throbbing, fevered brain" of the internet for the willingness of interested citizens, now dismissed as "conspiracy theorists," to challenge the wisdom of the Times. "Electrified by the Internet," the Times wrote mockingly on November 24, 1996, "suspicions about the crash of T.W.A. Flight 800 were almost instantly transmuted into convictions that it was the result of friendly fire." It would be another year before the FBI and CIA challenged that conviction, however falsely, but for the Times, the die was already cast. As the Strzok hearing made clear, the Democrats in Congress have no interest in the truth. Should the TWA 800 case ever make it to a congressional committee, the Democrats will feverishly obstruct any progress. For the Times, the battle will be existential, life and death. Its execs are the proud owners of the single greatest scandal in American media history. To admit ownership is to close their doors. You must accept my apologies. Last Saturday was Bastille Day and I didn't recognize it in last week's Monday Morning Humor. One of the defining rallying points of the French Revolution was the storming of the Bastille on 14 July 1789. Briefly, the French people, led by Danton and others, rose up and overthrew the monarchy of Louis XVI (and Marie-Antoinette). As an incident, the storming of the Bastille was of symbolic value than a crucial military victory. While the Bastille had in its time housed political prisoners, there were fewer than 10 inmates at the time of the attack on 14th July 1789. Moreover, none of the prisoners was noteworthy and it was the guns and other arms that were more valuable to the revolutionaries. Bastille Day is just like the Fourth of July except it takes place in France and we don't care about it. Bastille Day is just like the Fourth of July but with Dr. Joseph Guillotin's heady brand of hospitality. The French government announced yesterday that it has raised its terror alert level from "Run" to "Hide." The only two higher levels in France are "Surrender" and "Collaborate." The rise was precipitated by a recent fire that destroyed France's white flag factory, effectively paralyzing the country's military capability. A grenade fell onto a kitchen floor in France, it resulted in Linoleum Blownapart. Did you hear about the Frenchman who almost got away with stealing several paintings from the Louvre in Paris? After planning the crime, getting in and out past security, he was captured only two blocks away when his minivan ran out of gas. When asked how he could mastermind such an almost flawless crime, and then make such an obviously stupid error, he replied: "Monsieur, I had no Monet to buy Degas to make de Van Gogh." An Air France airliner was flying across the Atlantic when one of the engines quit. The captain announced to the passengers, "Eef zose of you on ze right side of ze aircraft will look out your window, you will notice we have lost one of our engines. Not to worry, ze aircraft can fly tres bien on its remaining three engines." Later into the flight the captain announced to the passengers, "Eef zose of you on ze right ide of ze aircraft will look out your window, you will notice we have lost another one of our engines. Not to worry, ze aircraft can fly normally on its remaining two engines." Much later into the flight the captain announced to the passengers, "Eef zose of you on ze left side of ze aircraft will look out your window, you will notice we have lost another one of our engines. Not to worry, ze aircraft can fly normally on its remaining one engine." And much later into the flight the captain announced to the passengers, "Eef zose of you on ze left side of ze aircraft will look out your window, you will notice we have lost our last engine. Not to worry, we have an excellent survival program." "Will zose of you who can swim please gather in ze first-class section. Zose of you who cannot swim, gather in ze aft cabin sie vous plie." "For zose of you in ze first-class cabin, when we land in ze water, please climb out onto ze wings, get into ze water and swim out to ze life rafts ze flight attendants have prepared for you." "For zose of you in ze aft cabin...THANK YOU for flying Air France!" I would rather have a German division in front of me than a French one behind me.--General George S. Patton. Going to war without France is like going deer hunting without your accordion.--Norman Schwartzkopf. The only time France wants us to go to war is when the German Army is sitting in Paris sipping coffee.--Regis Philbin. What do you expect from a culture and a nation that exerted more of its national will fighting against DisneyWorld and Big Macs than the Nazis?--Dennis Miller. Do you know it only took Germany three days to conquer France in WWII? And that's because it was raining.--John Xereas, Manager, DC Improv. Item Number:1 Date: 07/17/2018 AFGHANISTAN - KABUL PLANS ANOTHER CEASE-FIRE WITH TALIBAN (JUL 17/WSJ) WALL STREET JOURNAL -- The Afghan government is planning a second cease-fire with the Taliban in August as part of a comprehensive effort to advance peace talks, reports the Wall Street Journal. The proposed truce would coincide with Eid al-Adha, which will fall around Aug. 21-23 this year, according to U.S. and Afghan officials. Officials hope that a second cease-fire might create a breakthrough in efforts to finalize a format for peace talks. The announcement came one day after the New York Times reported that the U.S. is considering direct negotiations with the Taliban. The Taliban has long demanded direct talks with the U.S. and rejected negotiations with Afghan authorities. On Monday, U.S. Army Gen. John Nicholson, the head of the coalition in Afghanistan, indicated that the U.S. is open to any initiative to resolve the war through diplomatic means. At the same time, analysts warn that the Taliban might be playing for time, hoping that President Donald Trump's perceived lesser commitment to the war could lead to a U.S. withdrawal. Item Number:2 Date: 07/17/2018 AFGHANISTAN - NATIONWIDE OPS KILL 162 MILITANTS, SAYS DEFENSE MINISTRY (JUL 17/TN) TOLONEWS -- At least 162 armed militants have been killed and 66 injured in military operations around Afghanistan, according to defense officials cited by Tolo News (Afghanistan). Afghan security forces conducted 11 joint operations and 19 airstrikes over the previous 24 hours in 14 provinces, including Nangarhar, Kunar, Ghazni, Paktia, Urozgan, Zabul, Kanadahar, Farah, Badghis, Faryab, Kunduz, Balkh, Badakhshan and Helmand, the Afghan Ministry of Defense said on Saturday. Insurgent hideouts and weapons were also destroyed. Seven Taliban commanders were among those killed, officials said. Item Number:4 Date: 07/17/2018 FRANCE - MACRON SIGNS NEW MULTI-YEAR MILITARY BUDGET INCLUDING PROCUREMENT INCREASES (JUL 17/DN) DEFENSE NEWS -- President Emmanuel Macron has signed a multi-year defense budget that boosts procurement for the French air force, army and navy, reports Defense News. Macron signed the law, which covers the 2019-2025 military budget, on July 13. The law puts defense spending at its highest level in decades and is expected to reach the NATO benchmark of 2 percent of gross domestic product by 2025, Macron said before a military parade celebrating Bastille Day on July 14. The budget in 2019 will see an immediate boost of US$2.1 billion (1.8 billion euros), which will put the budget at US$40 billion (32.4 billion euros). Of this, US$760 million (650 million euros) is set aside for foreign deployments. One-third of the US$345 billion (295 billion euros) included in the bill would be released after the 2022 general elections, noted analysts. Among other elements, the budget covers the procurement of 1,700 armored vehicles for the army; five frigates, four nuclear-powered attack submarines and nine offshore patrol vessels for the navy; and 12 in-flight refueling tankers, 28 Rafale fighter jets and 55 upgraded Mirage 2000 fighter jets for the air force, he said. The new law also increases intelligence spending, the newspaper said. Item Number:5 Date: 07/17/2018 MEXICO - NEW PRESIDENT TARGETS PLANNED PURCHASE OF U.S. NAVAL HELICOPTERS FOR CUTS (JUL 17/RT) RUSSIA TODAY -- The newly elected president in Mexico says he wants to cancel contracts entered into by his predecessor, including the purchase of maritime helicopters from the United States, reports Russia's RT. The government of President Enrique Pena Nieto planned to spend US$1.36 billion to buy eight MH-60R Seahawk helicopters for the Mexican navy, reported Reuters. President-elect Andres Manuel Lopez Obrador as a candidate pledged to cut costs and reduce Mexico's reliance on the United States. The MH-60R purchase is too expensive, he told lawmakers last week. The U.S. State Dept. approved the potential sale in April. Obrador is scheduled to be sworn in as president on Dec. 1. Item Number:6 Date: 07/17/2018 NIGERIA - 2 DOZEN SOLDIERS MISSING AFTER BOKO HARAM ATTACK IN NORTHEAST (JUL 17/PREM) PREMIUM TIMES -- At least 23 Nigerian soldiers are missing after a militant attack in the northeast, reports the Premium Times (Nigeria). On Monday, the Nigerian military denied media reports that any of its soldiers were missing, reported Reuters. Twenty-two Boko Haram fighters were killed while attempting to steal military vehicles, said an army spokesman. On Saturday, hundreds of Boko Haram militants ambushed a military convoy in Boboshe village in Borno state. The troops were on a mission to clear militants from the deserted village, reported the News Agency of Nigeria. The militants were believed to be among those who have escaped the ongoing military offensive against Boko Haram in Sambisa Forest and the Lake Chad region. Only three of 11 trucks deployed to the area returned to their base in Maiduguri. Reinforcements were deployed following the attack. Boko Haram militants also attacked a military base in Yobe state on Sunday, reported Agence France Presse. No casualty figures were immediately available. Item Number:9 Date: 07/17/2018 SOUTH KOREA - MILITARY HOTLINE WITH NORTH FULLY RESTORED (JUL 17/YON) YONHAP -- North and South Korea have completely restored a communications hotline that connects their two militaries, reports the Yonhap news agency (Seoul). On Tuesday, the two sides restored fax and telephone connections operating along the hotline, which runs along the western part of the Korean peninsula. Restoring the hotline was part of an agreement reached in June during a meeting of generals from Pyongyang and Seoul. Service through the line was cut in 2016, but phone connections were restored in January ahead of the Winter Olympic Games in Pyeongchang. The U.N. Security Council allowed South Korea to provide the North with optical fiber cable transmission equipment and fax machines as part of the move. North and South Korea have also agreed to restore a similar line on the eastern side of the peninsula. The connection was blocked in 2011 and destroyed by a wildfire in 2013. The move is seen as an important confidence-building measure after the April inter-Korean summit, in which both sides agreed to halt hostile acts, enhance bilateral relations and pursue the denuclearization of the Korean peninsula. Item Number:13 Date: 07/17/2018 UNITED KINGDOM - DEFENSE MINISTRY LAUNCHES NEW AIR STRATEGY, SHOWS OFF FIGHTER CONCEPT (JUL 17/UKMOD) U.K. MINISTRY OF DEFENSE -- The U.K. has unveiled its new combat air strategy, along with a concept for its next-generation fighter jet, reports the U.K. Ministry of Defense. The strategy is designed to strengthen the U.K.'s leading role in the combat aircraft sector and protect vital industry skills, Defense Secretary Gavin Williamson said on Monday at the Farnborough International Airshow in southern England. The document outlines a path for the U.K. to acquire future combat air capabilities, with an emphasis on maximizing value to British industry. Williamson also unveiled a model of the Tempest, a British concept for its future fighter capability. The 2 billion pound (US$2.65 billion) program will be jointly conducted by BAE Systems, Leonardo, MBDA and Rolls-Royce. Key technologies to be developed for the jet include radar; active and passive electro-optical sensors; long-range sensors; advanced electronic support measures; weapons, including directed-energy weapons; conformal fuel tanks; weapon dispensers; and air-launched unmanned aerial vehicle dispensers. An acquisition decision is anticipated in late 2020, with final investment decisions to be made in 2025. The goal is to reach an operational capability by 2035, officials said. Leonardo UK officials said that they hoped to begin testing a flying demonstrator in the mid-2020s, reported Defense News. Item Number:14 Date: 07/17/2018 UNITED KINGDOM - GURKHA BRIGADE TO BEGIN RECRUITING FEMALES (JUL 17/SUNTIME) SUNDAY TIMES -- Gurkha units with the British army are set to begin recruiting female soldiers, reports the Sunday Times (U.K.). The British army is working to reduce a shortage of more than 5,500 troops, including by increasing the number of Gurkhas recruited from Nepal. Plans call for expanding the 3,000-strong Brigade of Gurkhas by 800 troops, including a new infantry battalion and new engineer and communications units. Fitness requirements will be the same for both female and male recruits, officials said. Candidates must pass a fitness test, including carrying 55 pounds (25 kg) of sand in a wicker basket up a steep, 3-mile (5-km) course, which must be completed in 48 minutes. Recruits must also be able to run 875 yards (800 m) in 2 minutes and 45 seconds, and complete 12 pull-ups and 70 sit-ups. Those who pass the fitness test are selected to undergo a 10-week infantry training course in Catterick, North Yorkshire. The course also includes English language and culture lessons. Nearly 50 Nepalese women participated in the army fitness test in 2007, but female enlistment remained closed. The first female Gurkha soldiers could arrive in the U.K. for infantry training as soon as the spring of 2020. Item Number:15 Date: 07/17/2018 USA - AGREEMENT REACHED FOR NEXT F-35 PRODUCTION LOT (JUL 17/ID) INSIDE DEFENSE -- The U.S. Dept. of Defense and Lockheed Martin have reached an initial agreement for the next low-rate initial production lot of F-35 Lightning II stealth fighters, reports Inside Defense. The F-35 Joint Program Office and Lockheed are in the final stages of negotiating the deal for Lot 11, which covers 141 jets for the U.S. and its program partners, said a JPO spokesman on Sunday. The deal is expected to cut the unit cost of the F-35A to $89 million, down from $94.6 million in Lot 10, a 6 percent reduction, reported Reuters. Total cost is estimated at $13 billion. Total contract value and unit costs will be revealed once the contract is finalized, the spokesman said. Lockheed recently delivered the 309th F-35, reported Military.com. Plans call for 91 jets to be delivered in 2018, up from 66 in 2017.